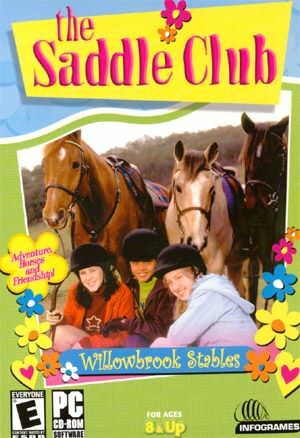 The Saddle Club is based on the extremely popular English book series called The Saddle Club that features the adventures of three teenage girls. Considering how popular the book was in the UK, it was eventually made into a television series and girls could finally see what their heroes now looked like. 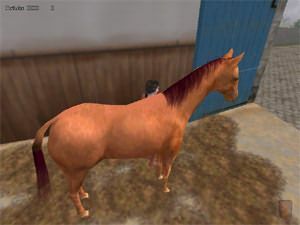 Developers IR Guru Interactive have loosely based the PC game on the television show that stars Lisa, Stevie and Carole who are the best of friends and they all share a love for horses. The game also contains footage from the television show and the actual voices of the girls who play the characters. The game is a combination of an adventure game meets arcade game and players must select which character they wish to play, either Lisa, Stevie or Carole. Once players have selected their characters, they must then choose a horse and make them their own by adding distinctive markings and colours. Selecting different characters doesn't make the outcome of the game different but it's a neat twist that I'm sure teenage girls will love. The basic premise behind The Saddle Club is to save Willowbrook Stables on Coventry Island that is about to be closed down by big business. You must somehow help the sweet old lady that runs the stables, Agnes to prevent the stables from being bought and demolished. In order to achieve this, players must complete a variety of different adventures, puzzles and horse events in order to progress through the game. Your characters must also collect points in the game that enables you to unlock pictures in your diary. For instance, by cleaning up the stables or engaging in the Pony Club, you are awarded points that can go towards unlocking the secret pictures in your diary. The beauty of The Saddle Club, unlike other games in the genre is that you can virtually explore any part of the island and when the local stableboy called Toby mentioned a witch that lives in the Coventry forests, my curiosity got to the better of me and I started searching for this elusive person. As you meet different people in the game, they will give you clues or missions that your character must complete. Although the challenges are fairly simple (yes I was stuck on a particular mission), I'm sure teenage girls will have no problem completing them as they are not too intensive or difficult. Graphically, The Saddle Club is one of those rare children games that actually supports high-resolution graphics. 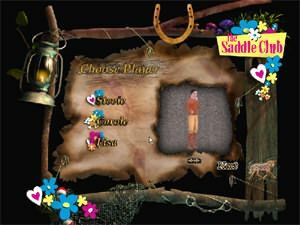 Unfortunately compared to games of today, The Saddle Club is extremely dated and contains quite a few glitches in the programming such as clipping, different frame-rate issues and a few texture problems. Fortunately the people who this game wasdesigned for will not notice these problems as it takes them away to a land that is filled with children, colourful graphics and a very interesting andmagical storyline. Imust also add that there are some great weather effects in the game andcharacters themselves are quite impressive. The only problem is that thecharacters have fairly poor texture details but the horses themselves areprofessionally designed. Thesoundtrack of The Saddle Club has been professionally done and features somesoothing music that will help gamers emerge into the world of Lisa, Stevie andCarole. The voice acting in the game has been professionally done (mainlybecause they contain the real voices of the actors who play the girls) and reallysuits the characters. There are plenty of background sounds in the game such asthe sounds of the weather, the noises of the horses and various other soundsthat all comes together perfectly. 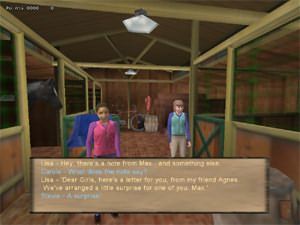 Inconclusion, The Saddle Club game is a great little game that is extremelyreminiscent of the old point and click Sierra games where gamers must travelaround a gaming world, collect items, solve puzzles and talk to characters inthe game. The graphics are not spectacular but it actually kind of suits thegame and combine that with the extremely mellow soundtrack and you have a gameperfect for kids of all ages and it's not called The Sims! Recommended!